Life on the Valley Local involves running a meandering wayfreight, serving the industries along a scenic branchline along the Connecticut river. When you're on the Local, you pretty much own the railroad - you may, occasionally and rarely, have to look out for a speeder or a work train. But you get done when you get done. No need for a fast clock with this kind of layout (though I played around with an app, just for kicks). 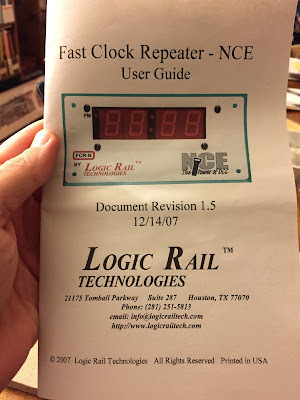 In fact, until recently I didn't even realize that my NCE DCC system had a fast clock built in. 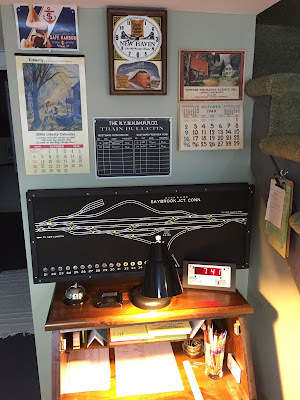 But since I started incorporating the Shore Line trains into my operating sessions, and especially since Randy developed a cool train register for the Agent/Operator to use - it's become obvious that I needed a clock at the A/O's desk. I researched a number of options, preferring an "analog looking" clock (for you millennials, that's the one with the hands and numbers :^) in keeping with my era. 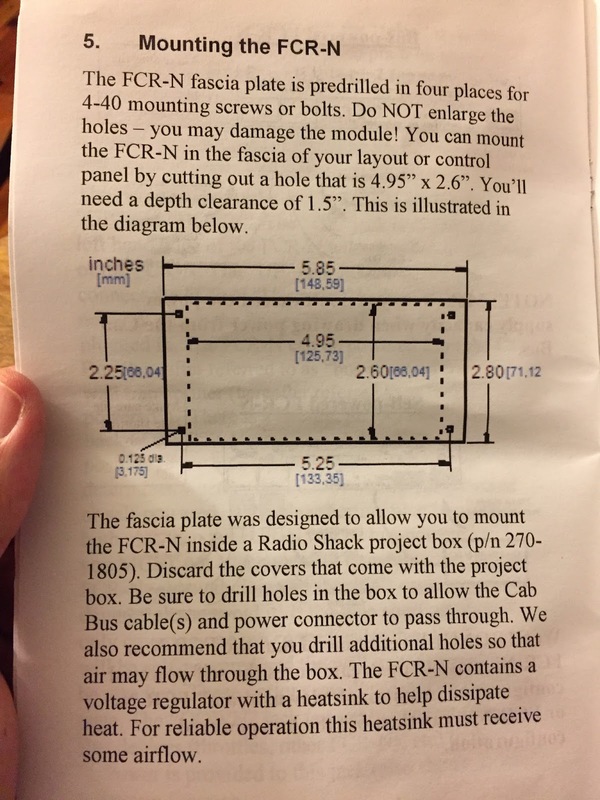 And I really liked the system that Jim Dufour uses on his layout. But they all involved more work and money than I was willing to do/spend - especially since I already had a fast clock system with NCE. Unfortunately, the NCE fast clock only reads out on the hammerhead throttles. That's great for the two mainline operators, but for the A/O I needed a desk clock that would tie-into and synchronize with the NCE system. Fortunately, Logic Rail Technologies makes just what I was looking for - provided I didn't mind a digital readout. I figured that was a small compromise to make for the convenience and ease of installation. "All I had to do was" extend a branch of my cab bus to come out behind the A/O desk for the clock to plug in. And besides - the mainline operators are using digital too. Conveniently, my wedding anniversary was coming up about the same time and the Missus was looking for gift suggestions . 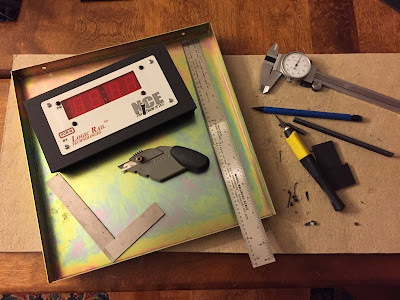 . . so she ordered the LRT fast clock and some decoder install supplies from Litchfield Station and had them sent to work (she worried later what the Capitol police would think when they scanned the package and saw a digital clock and wires.... but I digress). 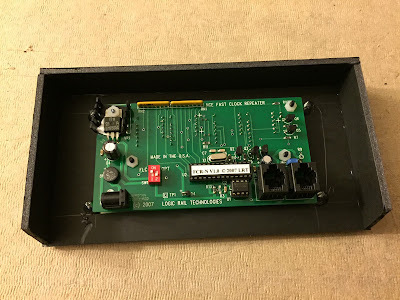 When I opened the package (after security finally released it), I was a little surprised to discover that there wasn't much to it - basically a PCB with a cover plate. 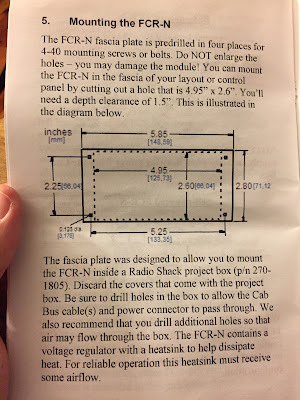 Now, this makes sense if you're mounting it to your fascia, but I wanted it as a desk clock. I could jsut prop it up, but that wouldn't look very finished. Fortunately, LRT designed the clock to be mounted inside a Radio Shack project box. Unfortunately, Radio Shacks are dropping like flies around here - hard to find one still open, and those didn't have the project box I needed. Even my new favorite store didn't have anything suitable. And then I remembered the cool NCE PowerCab Mount/Box I built from black foamcore a few months ago. I figured I could do the same here - and so I did. I angled the bottoms of the side pieces a bit to provide a stable backward lean - and mounted with #4 screws right into the board, secured at the back with hot glue. The PCB, showing the screws secured with hot glue. At the desk - and much more attractive than just propping up the raw/unboxed unit there, IMO. 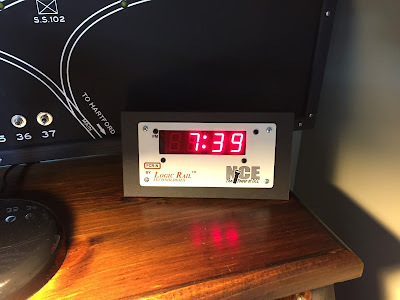 Since the clock plugs directly into the NCE cab bus, an unexpected - but very welcome - benefit of having this clock on the desk is that I'll know immediately as I go up the stairs if I forgot to turn off the DCC system. If the clock is on, so is the DCC. It took me more time agonizing over how to go about boxing this clock in than it did to finally do it. Once I gathered the tools and materials, it just took one evening of listening to Philip Marlowe on the "radio" with the Missus knitting on the other side of the room. 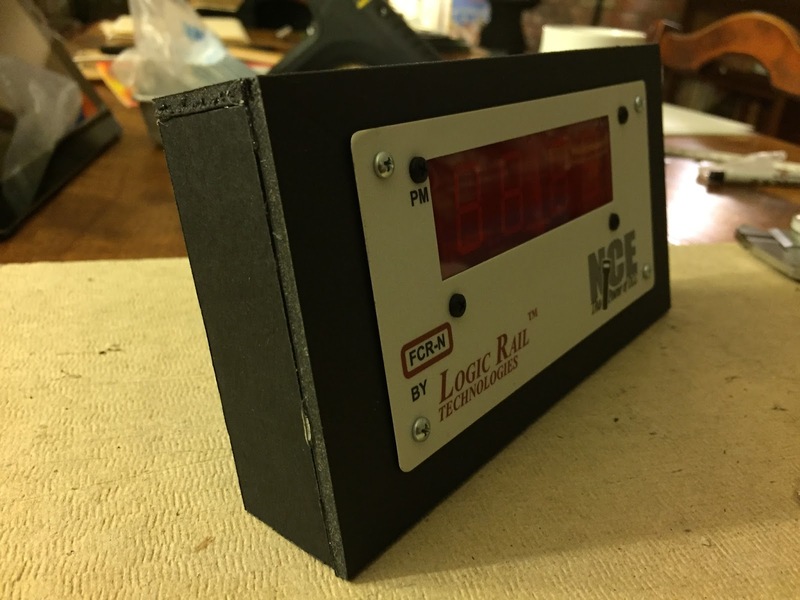 And now I have a handy-dandy clock to use for the next operating session!